Montes and Kaiken Wines - Write for Wine: It's Wine O'Clock Somewhere!Write for Wine: It's Wine O'Clock Somewhere! 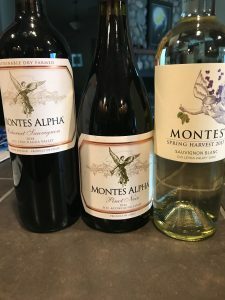 Montes Wines was formed in 1987, and the first Montes Alpha Cabernet Sauvignon — the first ‘premium’ wine to be exported from Chile –brought recognition to the winery. Aurelio also produced the first Chilean “ultra-premium” or “icon” wine, Montes Alpha ‘M’ 1996, before moving across the Andes to Argentina. In 2001, he also started making Kaiken Wines in Mendoza. Production of the flagship Montes Alpha M is extremely limited, and vintages are only released if Aurelio Montes considers that “the quality of the wine is up to demanding standards.” The 2012 vintage is a voluptuous blend of Cabernet Sauvignon (80%), Cabernet Franc (10%), Merlot (5%), and Petit Verdot (5%). Sophisticated and elegant, the “M” is an intense wine layered with aromas and flavors of cherries, raspberries, vanilla bean, licorice, caramel and toast. Drink it now after at least one hour of decanting, or you can cellar it for up to 20 years. Montes Alpha Cabernet Sauvignon is legendary, as mentioned earlier, and Montes best-known Chilean wine. We were fortunate to taste two vintages. The 2012 Cab features notes of strawberries, cherries, toffee, coffee and vanilla. The 2014 offers plums, figs, blackberries, raspberries, chocolate and butterscotch. Both are complex, robust, full-bodied and balanced. Aurelio Montes noted that Cabernet Sauvignon from Colchagua, like these, “has bigger tannins and more spiciness, while Argentina Cab has soft tannins and ripe red fruit,” like the next two wines we tasted. 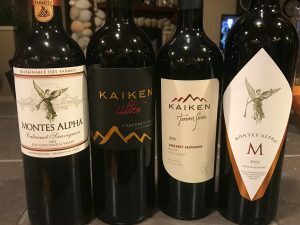 Kaiken Ultra 2015 is a smooth Cabernet Sauvignon from Argentina, with black currant, cranberry and cherry notes, and hints of minerality, tobacco and spices. Full-bodied, elegant, complex and structured, the Cab character shines through. Decant for at least 30 minutes, kick back and enjoy. This is also a great party wine, at a decent price point. This is an Argentinean great-value wine that blends Cabernet Sauvignon (80%), Malbec (12%) and Petit Verdot (8%). Complex aromas and flavors of plums, cherries, black fruit, spices, chocolate, coffee, cassis and vanilla are backed by the structure and depth of the Petit Verdot. Soft, silky and powerful too. We enjoyed this Pinot Noir during our Thanksgiving feast – it was a perfect complement to turkey and the side dishes. As an extra bonus, it only needed decanting for 15 minutes. A medium-bodied Pinot, the pretty nose smells of violets, plums, cherries and spice, with a hint of white pepper. The palate is rich with flavors of plums, blackberries, black cherries and black tea. This Sauv Blanc is a wonderful summer sipper, but it also pairs well with seafood, Caesar salad or lemon chicken anytime of the year. With aromatics of peaches and orange blossoms, the citrus notes are what draws us to Sauv Blancs like this one. Thank you to Montes and Kaiken Wines for the wine samples. Any of these wines will be great for your holiday dinner or parties. This entry was posted in Argentina, Bordeaux Blend, Cabernet Franc, Cabernet Sauvignon, Chile, Malbec, Merlot, Petit Verdot, Pinot Noir, Sauvignon Blanc, Wine and tagged Argentina wine, Bordeaux blend, Cab Franc, Cabernet Sauvignon, Chilean wine, Kaiken Terroir Series, Kaiken Wines, Malbec, Merlot, Montes Alpha M, Montes Wines, Petit Verdot, Pinot Noir, Sauv Blanc, Sauvignon Blanc, wine, wineries by Margot. Bookmark the permalink.